Before there was Kate and William, before there was Diana and Charles, there wasLavinia and Charles. 1863 was a tumultuous year in American history; the year that would see Gettysburg began with the official passage of the Emancipation Proclamation. While the Civil War ground on in the South, New York was seething with unrest; the war was not popular there, as a host of "Copperheads"Northerners sympathetic to the Confederacystirred up unrest. The immigrants, particularly the Irish, seethed with hatred at all the newly-freed slaves making their way to the city, and into the job market. The impending draft, which excused any gentleman who could afford to pay the $300 commutation fee, further divided the populace. But in February, an event took place which captured the entire nation's fancy, and knocked all news of the Civil War off the front pagesthe wedding of Mr. and Mrs. General Tom Thumb. The "Loving Lilliputians," the "Little Queen of Beauty" and her "Fairy Prince"all of New York society clamored to be invited to their nuptials. Every detail of Vinnie's dainty trousseau was reported, in lavish detail; her exquisite gown was made by one of the most famous dressmakers of the time, Madame Demorest. Astors and Vanderbilts competed to give the most elaborate gift. And President and Mrs. Lincoln themselves invited the newlyweds to honeymoon at the White House. 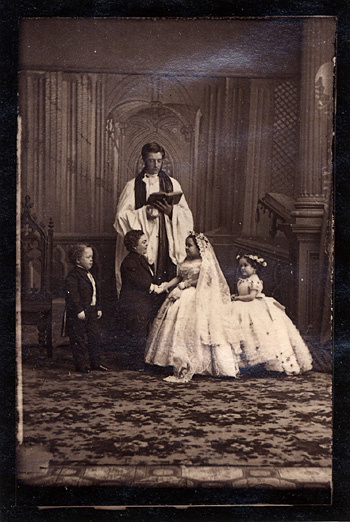 Their elaborate wedding at Grace Episcopal Church on February 10th, 1863, was the gift of their great friend (and showman), P.T. Barnum, who took credit for playing matchmaker to the pair. While Barnum refrained from selling tickets to the wedding itself, he had no problem selling tickets to the grand reception at the Metropolitan Hotel. The diminutive wedding party, which also included Vinnie's even tinier sister, Minnie, had to perch on top of a piano in order to greet their 2,000 guests. The country was simply enchanted by this miniature couple, apparently struck by Cupid's dainty arrow; it was the perfect antidote to a nation weary of war and strife. For a few days, anyway, the entire nation could open the newspaper and not be confronted by casualty lists but, rather, flowery paeans to a true "Love in Miniature." A few years after the wedding, a strange phenomenon began to sweep the landthe "Tom Thumb Wedding." Staged primarily at churches and schools, often as fundraisers, children would dress up in wedding finery and be "married" by a "minister." 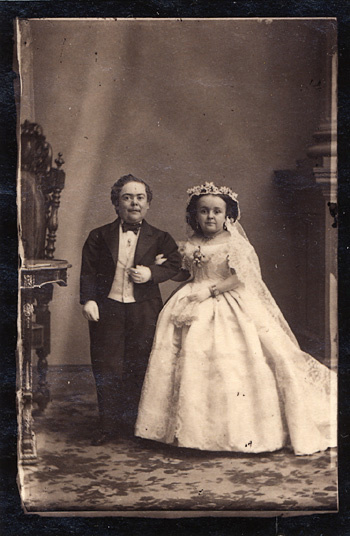 While the popularity of these weddings seemed to peak prior to World War II, there are still Tom Thumb Weddings being performed to this day. Even in America, it seems, the idea of a royal wedding, albeit a miniature one, never goes out of style.